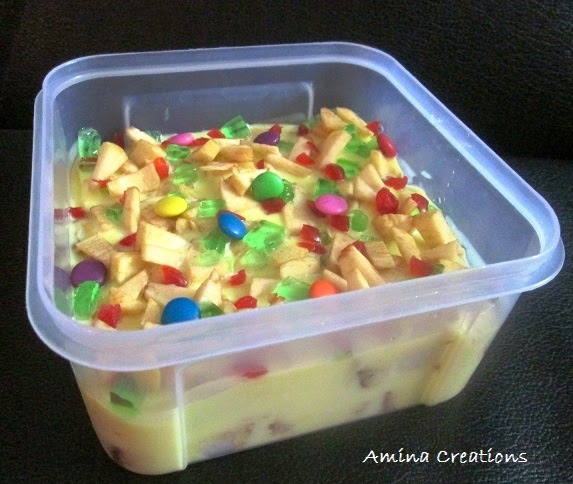 Trifle is a rich and delicious dessert which can be assembled in just about half an hour. This is an ideal dessert that you can serve on a special occasion, parties or after lunch when you have guests visiting your home. You can prepare different types of trifle depending on what fruits you use. Each fruit will add a different flavor and taste to the trifle. Here I have used apple, but you can make mango trifle, banana trifle, pear trifle or add in a variety of fruits to make fruit trifle. First prepare the custard. For this heat milk in a pan, when it has reached luke warm state, take 1 cup of it and add custard powder. Mix well such that there are no lumps. Bring the milk to a boil, then reduce heat and cook for about 10 minutes so that the milk thickens. Increase the heat, add sugar and mix well. When the sugar has dissolved, add the milk with custard powder and stir well. Cook for a couple of minutes till the custard thickens. Switch off the gas and keep ready. For the sugar syrup, heat sugar in a pan, add few drops of water and heat till the sugar melts and you get a golden brown colour. Add some more water to form a syrup. Make sure not to burn the sugar as it will give a bitter taste. Allow both the custard and syrup to cool down completely before assembling them for the trifle. Now for the assembly, take a bowl and line it with a layer of cake pieces. Pour 2 tbsp of caramelized sugar syrup on top. 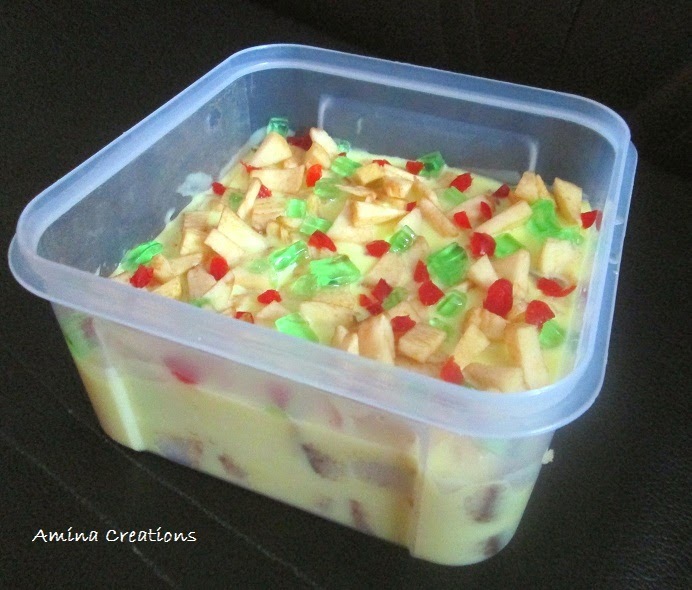 Layer this with apple pieces and pour custard on top such that it covers the apples completely. Repeat the process once or twice and finally garnish with chopped apples and chopped cherries. Place this inside the refrigerator and refrigerate for atleast 4 hours. Decorate with gems and serve.